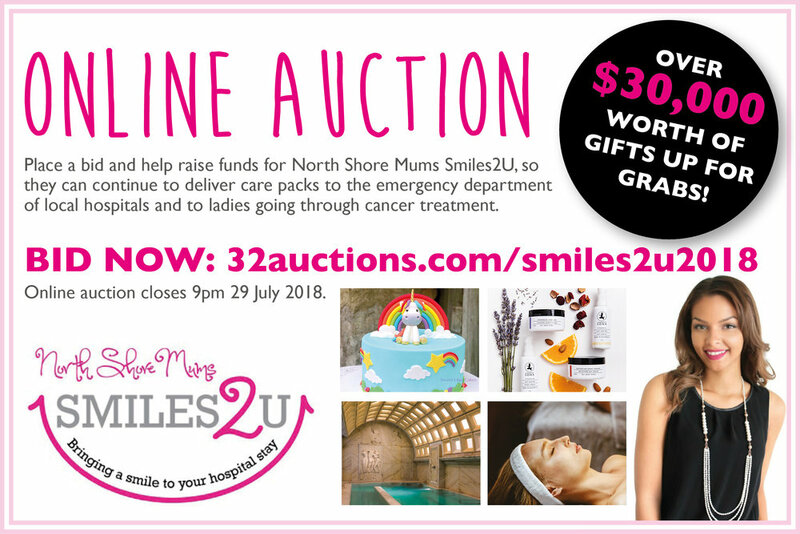 The Smiles2U Online Auction is now LIVE and will be heavily promoted across North Shore Mums and Smiles2U website, e-newsletter, Facebook and Instagram for over two weeks. With over $30,000 worth in prizes up for grabs we're sure you will find something special for your loved one AND be bringing smiles to the children in hospital. Jump online today and make a bid. Escape the house and have a fun night out for a great local cause! North Shore Mums Smiles2U is hosting a screening of ‘Mamma Mia: Here We Go Again’ at Event Cinema Hornsby on Saturday 28 July. Arrive from 7.00pm for a pre-movie drink (the bar will be open) before moving into the cinema around 8.15pm for an 8.30pm screening of the movie. You can even take your glass of wine into the cinema! Tickets are just $30 which includes the movie, an amazing goodie bag, free candy bar and lucky door prizes. 100% of proceeds are going directly to Smiles2U, so they can continue the wonderful work that they are doing at seven local hospitals across the North Shore. Make it your early Mother’s Group, School Class or just random Gal Pal celebration – there are lots of great restaurants in Hornsby that you could book for a pre-movie dinner too. Contact us below for details of drop off locations. A very BIG Thank You from the Smiles2U team for a very successful fundraising event last Saturday night. 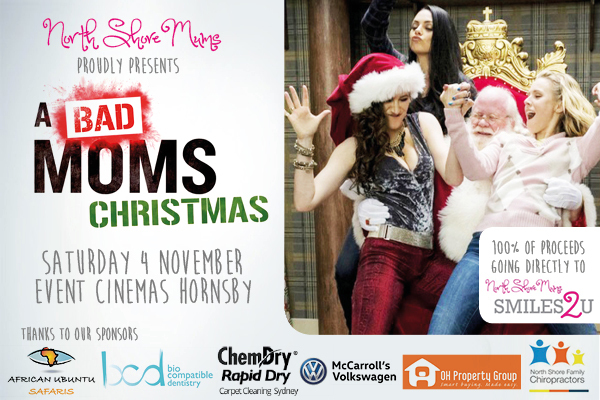 I'm sure all those who attended will agree that we all had sore stomach muscles from laughing so much whilst watching "A Bad Moms Christmas". The atmosphere was amazing and by the looks of it the ladies enjoyed the Candy Bar! We've never seen a Candy Bar disappear so quickly! Thank you to our wonderful sponsors of the evening, the sponsors for the goodie bags and the lucky door prizes. To Annette from the Laser Lounge in Wahroonga and Jessica from Petals & Ivy for the gorgeous flowers in the function room. Thank you to those who brought a Christmas present along for a sick child who will be in hospital this Christmas. A staggering $11,645 was raised for Smiles2U! This money will help us continue supporting the five local hospitals in Sydney. We can now look at implementing some new ideas in the next 6-12 months! Thank you so much for having the faith and trust in us to continue to provide these much needed care packs and smiles bags to the hospitals. We know that they’re making a hospital experience far less daunting and scary for the kids. We have put together a gallery of photo's from last Saturday night. thank you to Anna Spencer from A.Spencer Photography for capturing the essence of a successful evening. The details are out! The event is in the diary! Let's come together for a great night out. The Bridgeview Hotel in Willoughby are holding a Trivia Night for Smiles2U on Tuesday 27th June 2017 at 7pm. Come along and get your friends together and book a table. Call the Bridgeview Hotel directly for bookings 02 9958 4145. $20 per person. No minimum numbers for tables. To raise money for Smiles2u, we're running a raffle and have over $2000 in prizes to be won! To make it as easy as possible for everyone to buy a ticket and go in the running to win, you can buy your tickets online here! It's just $5 for one or $10 for 3. The winners will be drawn on 27 June at the Charity Trivia night at the Bridgeview Hotel in Willoughby. Ticket holders do not need to be present at the event to be a winner.